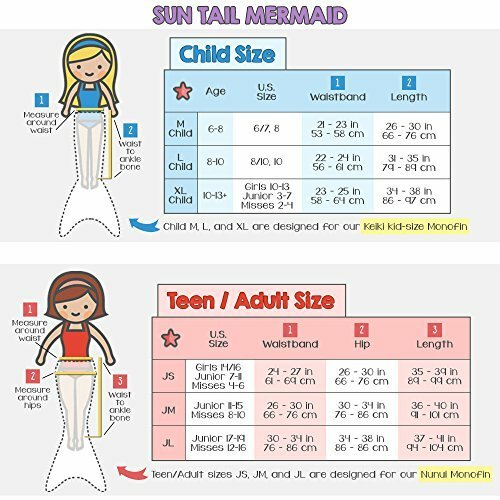 The mermaid swim fins and tails from Sun Tail transform little swimmers into pseudo-sirens of the sea—while under the watchful eyes of a nearby adult. The star of this swimming show is the monofin. It’s a different take on a flipper that blends the just-right amount of flexibility and durability. It has a designated foot pocket that keeps kids' feet comfortable and in place. To complete the look, kids can pull a sparkly and stretchy mermaid tail on over the monofin (though it is plenty fun on its own). There is a bit of a learning curve to get the hang of swimming with a tail, and kids will definitely need an adult nearby and some practice to get the hang of it. 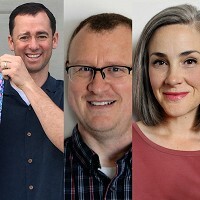 Sun Tail Co-Founders (and neighbors) Cameron Taylor and Jessica and Eric Wiseman were inspired by a few mermaid-loving little girls. We can think of many kids who will give these tails two fins up. How do you learn to swim with the Monofin? Children should always use adult supervision when using these. First, it is recommended to practice the mermaid kick (butterfly kick, sometimes called a dolphin kick) without the Monofin. Try holding onto the side of the pool at first and once child and guardian feel comfortable, add the Monofin. Hold onto the side of the pool and practice the mermaid kick while wearing the Monofin. 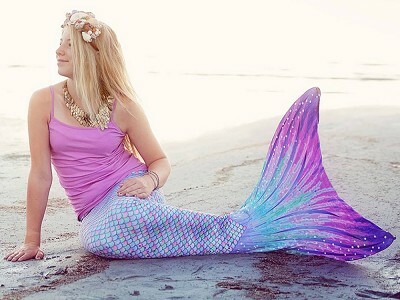 As soon as child and guardian feel comfortable with the Monofin, add the Mermaid Tail. Practice again and make sure you feel comfortable in the whole Monofin and Mermaid Tail Swim Set before swimming away from the side of the pool. Swimmers of all abilities can learn to use these, but they are recommended for stronger swimmers. Monofins can help less experienced swimmers gain confidence and improve their swimming, but adult supervision is always required when using. Please note that Monofins are not swimming aids, and swimmers should always practice by holding on to the side of the pool or in shallow waters before swimming in deeper water. How should you care for your Monofin and swimming costume? Rinsing your Monofin in plain water after you're done swimming is always a good idea. You can unfasten the velcro in the back and prop the foot pocket open to speed drying. The entire foot pocket can be washed with mild detergent and air dried if needed. Please don't put your foot pockets in the dryer, they may melt or warp. How do the Monofin sizes run? The child's Monofin fits a US child's size 10 all the way up to about a US women's size 7. It's made to fit kids ages 6-12. The teen/adult-sized Monofin fits pre-teen/teen-sized feet all the way to a US men's size 13 foot. It's designed to fit people ages 13 and up. 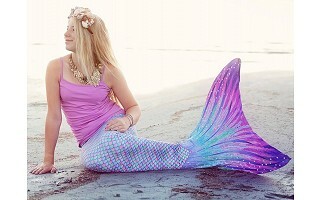 The top Mermaid Tail designers and Monofin inventors are all parents, too. They know the importance of fun and safe water toys, and work to ensure top safety for your precious mermaids and mermen. Please see safety information. 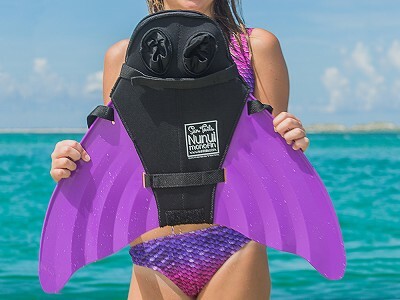 The mermaid swim fins and tails from Sun Tail transform little swimmers into pseudo-sirens of the sea—while under the watchful eyes of a nearby adult. The star of this swimming show is the monofin. It’s a different take on a flipper that blends the just-right amount of flexibility and durability. It has a designated foot pocket that keeps kids' feet comfortable and in place. To complete the look, kids can pull a sparkly and stretchy mermaid tail on over the monofin (though it is plenty fun on its own). There is a bit of a learning curve to get the hang of swimming with a tail, and kids will definitely need an adult nearby and some practice to get the hang of it.